Pioneers in the industry, we offer hdpe laminated paper bag and hdpe paper laminated bags from India. Our company is one of the renowned manufacturers and suppliers of White HDPE Laminated Bag for Pharmaceutical Industry in the market at present. Post-procurement, these bags are thoroughly inspected on well-defined parameters to rule out every possibility of defect and ensure that quality is maintained. These are made available from our side as per the set industry guidelines and at extremely affordable rates as well. Widely used in pharmaceutical industry, these bags possess hygienic and chemically inert traits. 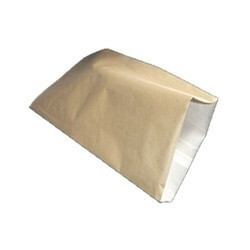 We are recognized as a successful manufacturers and suppliers of HDPE Paper Laminated Bags in the market at present. These bags are derived from High-density polyethylene, which is a polyethylene thermoplastic made from petroleum. Further, these bags are highly preferred by our customers owing to their great strength and can withstand high temperature as well. These are made available from our side as per the set industry guidelines and at extremely affordable rates as well.